Author(s): Anis Ben-Amar, Department of Plant Molecular Physiology, Center of Biotechnology of Borj Cedria, Tunisia; and Agro- Science.GmbH, AlPlanta-Institute for Plant Research, Neustadt an der Weinstraβe, Germany. Samia Daldoul, Götz M. Reustle, Gabriele Krczal, Ahmed Mliki. In the post-genomic era, increasingly sophisticated genetic tools are being developed with the long-term goal of understanding how the coordinated activity of genes gives rise to a complex organism. With the advent of the next generation sequencing associated with effective computational approaches, wide variety of plant species have been fully sequenced giving a wealth of data sequence information on structure and organization of plant genomes. Since thousands of gene sequences are already known, recently developed functional genomics approaches provide powerful tools to analyze plant gene functions through various gene manipulation technologies. Integration of different omics platforms along with gene annotation and computational analysis may elucidate a complete view in a system biology level. Extensive investigations on reverse genetics methodologies were deployed for assigning biological function to a specific gene or gene product. We provide here an updated overview of these high throughout strategies highlighting recent advances in the knowledge of functional genomics in plants. Keywords: Functional genomics, Omics platforms, Reverse genetics, Large-scale sequencing. Affiliation:Department of Plant Molecular Physiology, Center of Biotechnology of Borj Cedria, Tunisia; and Agro- Science.GmbH, AlPlanta-Institute for Plant Research, Neustadt an der Weinstraβe, Germany. Keywords:Functional genomics, Omics platforms, Reverse genetics, Large-scale sequencing. Abstract:In the post-genomic era, increasingly sophisticated genetic tools are being developed with the long-term goal of understanding how the coordinated activity of genes gives rise to a complex organism. With the advent of the next generation sequencing associated with effective computational approaches, wide variety of plant species have been fully sequenced giving a wealth of data sequence information on structure and organization of plant genomes. 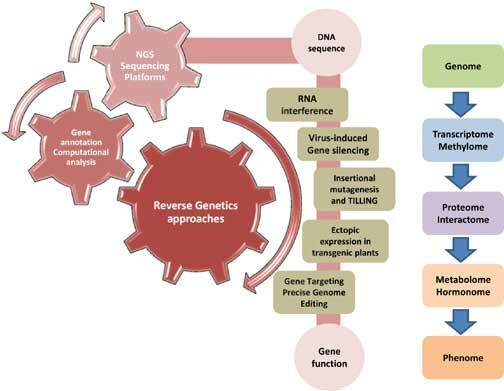 Since thousands of gene sequences are already known, recently developed functional genomics approaches provide powerful tools to analyze plant gene functions through various gene manipulation technologies. Integration of different omics platforms along with gene annotation and computational analysis may elucidate a complete view in a system biology level. Extensive investigations on reverse genetics methodologies were deployed for assigning biological function to a specific gene or gene product. We provide here an updated overview of these high throughout strategies highlighting recent advances in the knowledge of functional genomics in plants.